Right in downtown Carleton is a little store which has all sorts of food, beverage, and other supplies. 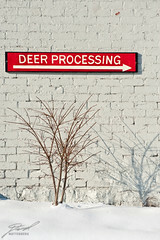 They also do deer processing during hunting season and I spotted this sign on the side of that building while we were out there Sunday. It caught my attention, perhaps because of the bright red in the field of beige, but I loved the bare bush and its shadow too.